SINGAPORE - Factory output contracted for the eighth consecutive month in September, performing slightly worse than private-sector forecasters had tipped. The latest manufacturing data, which showed output sliding 4.8 per cent last month over the same period a year ago, came in below economists' expectations of a 4.5 per cent fall. The transport engineering segment saw the largest plunge in output at 24 per cent. 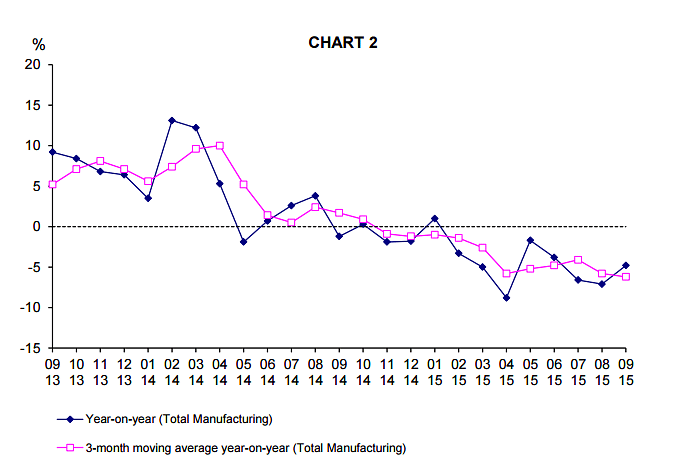 The electronics, precision engineering and general manufacturing clusters also registered declines. The volatile biomedical manufacturing cluster, however, surged 26.3 per cent over the same month last year, with both the pharmaceuticals and medical technology segments recording output growth. The chemicals cluster was also a bright spot and saw output rising 4.4 per cent. If biomedical manufacturing were excluded, overall manufacturing output would have fallen a steeper 10.2 per cent.